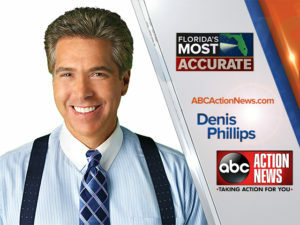 Denis Phillips’ desire to be a television meteorologist began by seeing Santa on radar when he was 6 years old. It’s true… although severe weather really hooked him. He is one of those crazies you’ll see tied to a palm tree in a category 3 hurricane… doing a live shot… sideways. Denis attended Penn State University because of its reputation in weather forecasting, since one out of every four meteorologists in the world comes from PSU. He SWEARS their national championship football team the year before had NOTHING to do with it! Denis graduated in 1985 and got his first on-air position in Salisbury, Maryland, shortly thereafter. After stops in Gainesville, Providence, and Los Angeles, Denis finally ended up in Tampa. He says the Bay area offers all the challenges weather-wise he could ever hope for: severe thunderstorms, tropical storms, and plenty of opportunities to tie himself to a palm tree!